I’d like to think that I’m handling this “no running” stuff pretty well. If you ask Geoff how I’m doing, he’ll roll his eyes and give a smug face that might lead you to believe I’m not doing well, but I’m pretty sure he’s just doing that for dramatic effect. 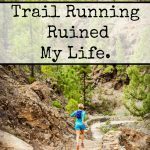 I haven’t cried, I haven’t whined, I’ve kept my FOMO in check…even though I had to turn down some pretty kickass events, including the Desert Rats Kokopelli 150 and the Barkley Fall Classic (to which Laz asked me why I couldn’t just keep my guts duct taped in until then…sigh). 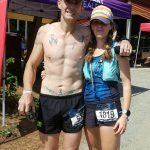 I didn’t even lose my mind when I spent this weekend spectating and sort of crewing for the Hell Hole Hundred while my other half ran a spontaneous 60K. It wasn’t easy, of course, but I held it together. Now, believe it or not, my kids have never been camping. At ages 8 and 10, I consider this a huge failure on my part. Between school, work, the fact that they split their time between their dad’s house and ours, and the fact that Myrtle Beach isn’t really a camping destination (unless you count the massive oceanfront RV parks as camping, which I do not) I suppose I can forgive myself a little for this massive oversight as a woodsy, crunchy, outdoorsy, parent. Hell Hole Hundred fell on the first weekend of summer vacation from school, so it seemed like the perfect opportunity to take the kids out for their first official night in a tent…as well as some ultra spectating for good measure. I won’t lie, the world as a whole terrifies me as a parent, and while I of course never regret having my children, I often hate that I brought children into this scary world. So it is wildly important to me that I expose my boys to all of the good in the world; the best parts, and the best people in life. 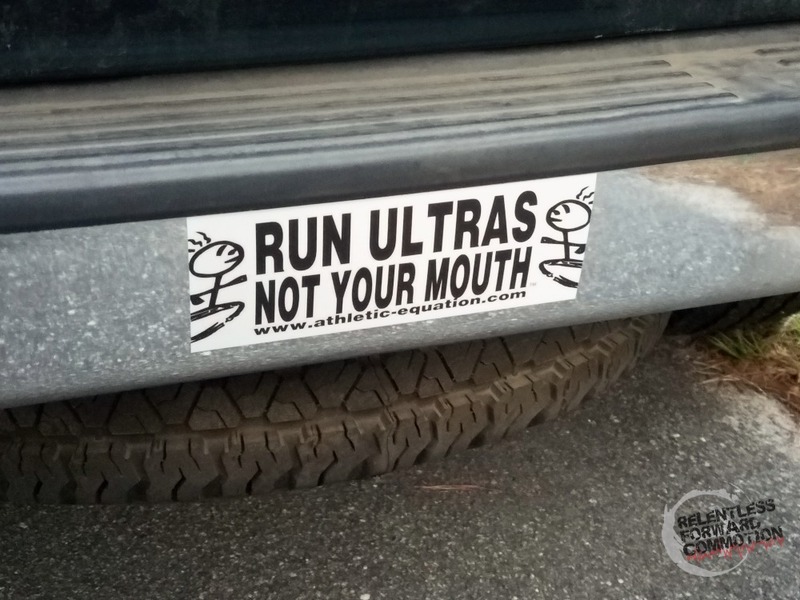 The ultra running community, in my opinion, certainly embodies everything awesome about life. Friday morning we packed my little adventure mobile to the brim, and for the first time in our nearly 11 years together (myself and the Scion XB that is) I finally had the realization that my little family has outgrown my favorite car ever. Alas, we somehow managed to cram all of the necessities and family members into the car, and we headed to Bethera, SC. 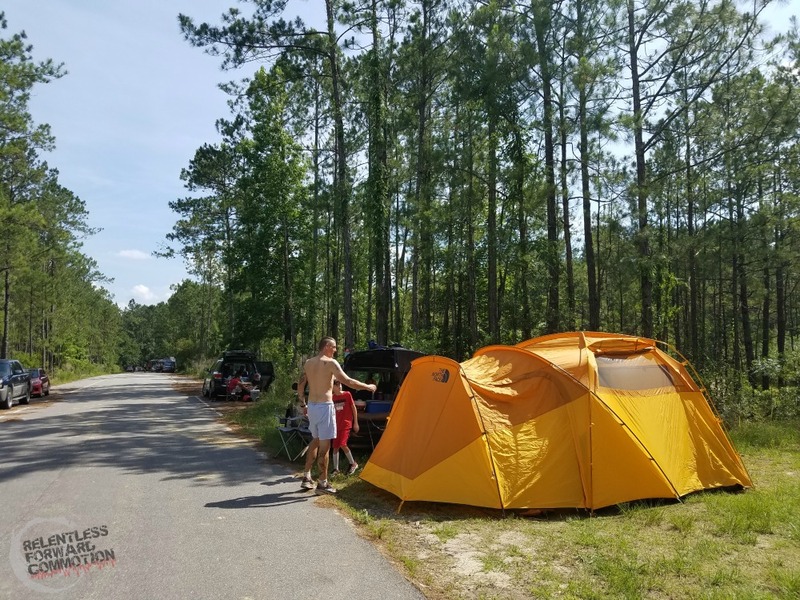 And after a drive through the Francis Marion National Forest that included the longest, flattest, straightest road I’ve ever been on, we arrived at the Jericho Horse Trail head. It was my 2nd place overall finishers rock from Hallucination 24 Hour race back in February. I somehow managed to miss the brief awards ceremony post race (don’t ask me how, I was a little delirious) and had been jokingly pestering Chad for my rock award ever since. The rock is beautiful, and was totally worth the wait. We headed down the paved road and around a 90 degree turn and saw where the other racers had sent up their tents. 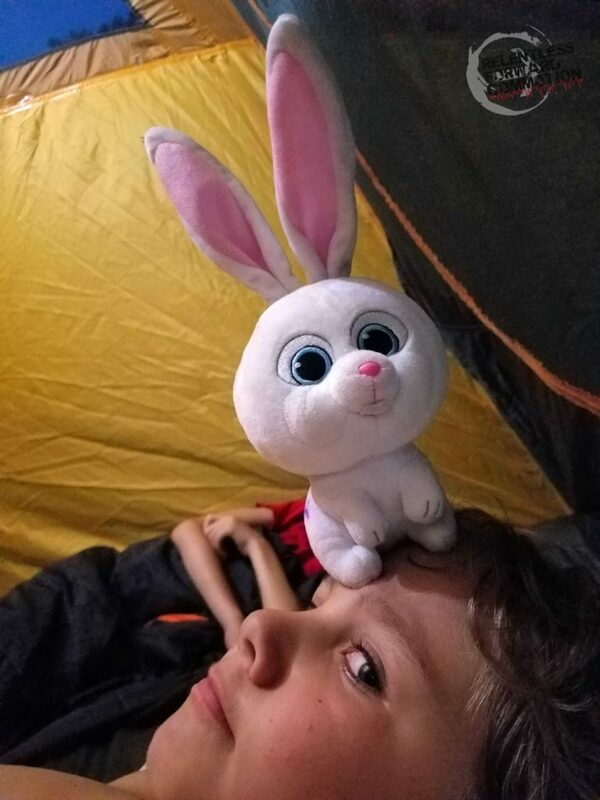 My 10 year old was slightly disappointed at first: he had envisioned his first camping experience as a tent in the middle of the forest with no one around. Instead, we popped our tent up on the edge of the paved road, next to other tents, cars, RV’s, and whirring generators. Sorry kid. 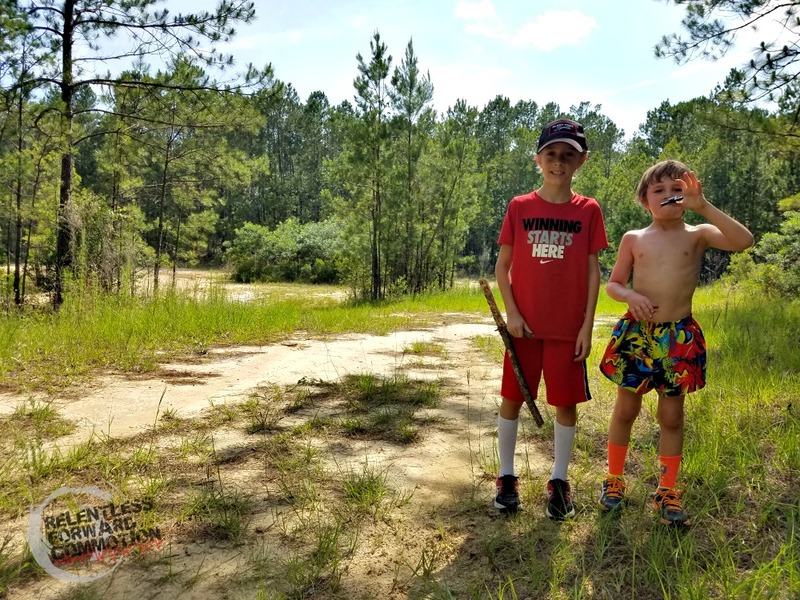 Have no fear, his disappointment was almost immediately replaced by excitement when they realized there was a giant sandpit that they could play in, as well as sticks and rocks galore. We spent the afternoon/evening exploring, cheering on the start of the night time races, eating, and relaxing…some of us more than others. Nightfall came fast, and soon everyone was asleep…except for the two giant bullfrogs that resided a mere 100 yards away, an owl, a pack of coyotes, the overnight racers, and myself. 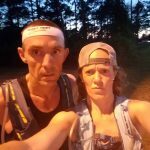 Between wanting to make sure my kids had a solid first nights sleep in a tent, and making sure my husband actually got sleep before his race, I was wide awake. Mom life. Geoff’s alarm went off somewhere around 5 am. I got out of the tent with him, and started pounding caffeine. Spectating races is hard work, after all (that’s only a tiny bit of sarcasm). Geoff got ready, I sat quietly and awkwardly, not knowing what to do in this new position of “non runner”, and the kids slept. Eventually we headed down to the race start to listen to some pre-race warnings from RD Chad, including but not limited to “don’t touch ANYTHING you wouldn’t want to bite you” and “pay attention, there are thousands of acres of forest out here, don’t get lost”. I can tell you that the course was a 16.3 mile loop. The 60K, Geoff’s distance, included two of the 16.3 mile loops, followed by an out and back to make up the rest of the mileage. I can also tell you that it was flipping HOT out. I’d guess that temps were in the high 80’s, if not 90’s in the sun. Spectators were sweating, runners looked downright miserable. 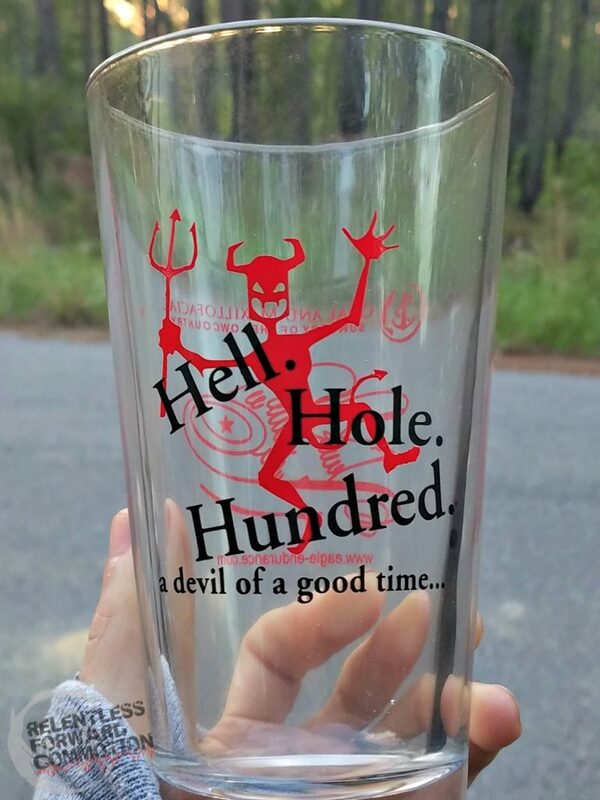 The race name “Hell Hole” certainly did a great job describing the conditions. 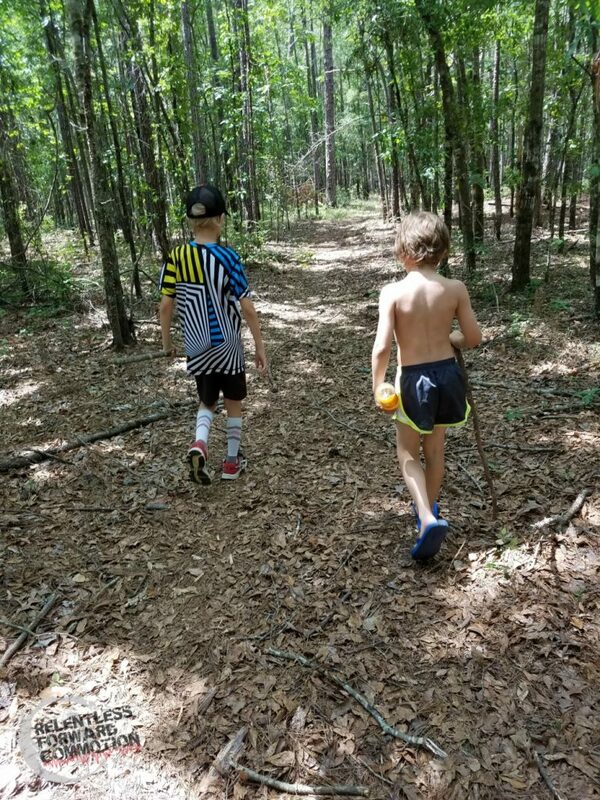 After the start of the race, I rallied the kids, fed all of us breakfast, and headed out on the trails ourselves…where we were immediately attacked by a giant swarm of mosquitos. Bugs in the Low Country swamps do not care about you or your DEET filled bug spray, they are ruthless. So we bailed on the trails and played in the giant sandpit instead. Geoff predicted it would take him approximately 3 hours to finish a loop, so at the three hour mark we packed up a bag full of bug spray, sunscreen, and Geoff’s tailwind, and headed over to the start/finish area. We both had cell phones on us, but there was absolutely zero cell phone service. I couldn’t even send a phone call if I tried, so we definitely had a lot of “hurry up and wait” moments. Geoff came through just over 3 hours, and was looking really good, despite the heat. A quick few seconds of chatting, and he was back out on the course again. Is this non race report boring you yet? If you’re still here, now comes the good stuff. Fast forward 3 more hours, and we are back at the finish line, waiting for Geoff to finish his second loop. We are sitting there for some time, and I see what I think is the first place guy finish his second lap, then the second place guy finish his second lap, then Geoff. Geoff is looking really strong, and I tell him “you’re third place male!” I can see the excitement in his face. He’s having a strong race, and feeling surprisingly good, despite the fact that he ran 100 miles less than a month ago. I help him fill his hydration bladder and handhelds, and he’s off on the last out and back section. I’m excited for him…until a guy crosses the finish line declaring to the volunteers that he’s done, he finished the 60K. I hadn’t seen this guy in my initial assessment of the top three men (I was probably too busy trying to get my youngest to stop digging holes ON the race course), which means that bumps Geoff down to 4th place. I’ve broken one of the cardinal rules of race spectating: never tell someone what place they are in unless you are absolutely, 100% sure. 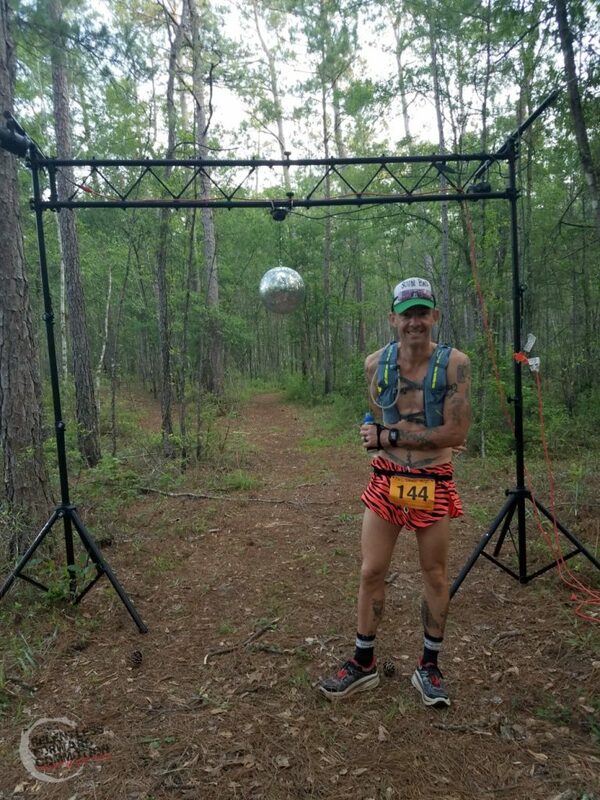 Before we know it, Geoff is done, 4th place overall in the 60K. He immediately declared to anyone who would listen that there is no way in hell (ha) he would even want to attempt a hundred miler on this course in that heat, which of course immediately gave me a crazy case of FOMO. 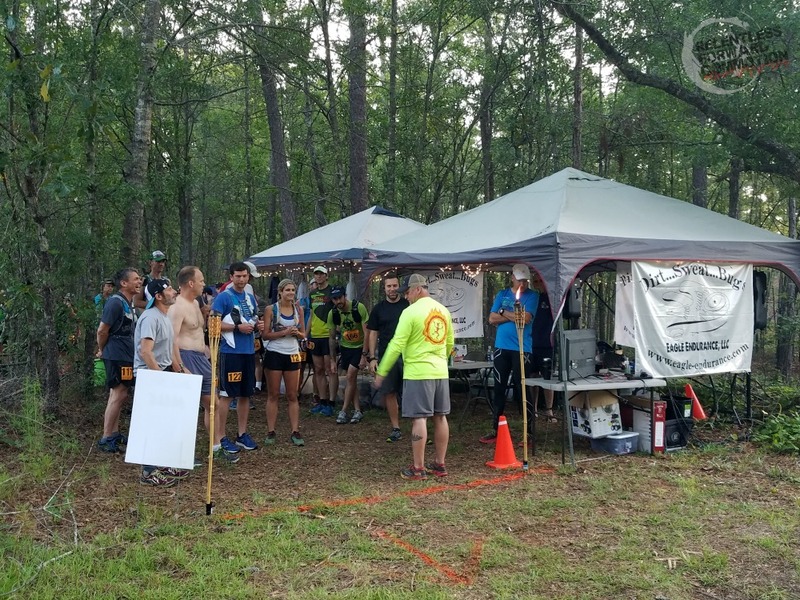 – Eagle Endurance/Chad Haffa and his volunteers put on an amazing race, always. 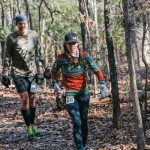 The trails are clearly marked, the aid stations plentiful, and the finishers awards pretty unique. 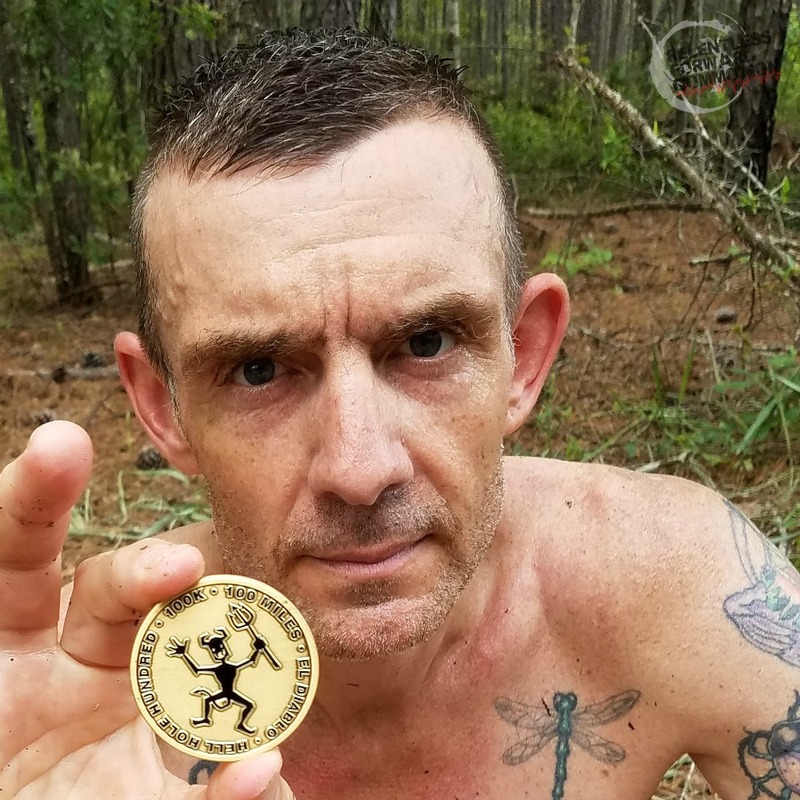 – If you want to suffer in the heat, get chased by water moccasins, wild boars, and potential angry locals, this is the race for you. Half of you are shaking your head right now saying “NO WAY” and the other half are thinking “hell yeah, that sounds like a good time! – Having the option to camp is always an added bonus. 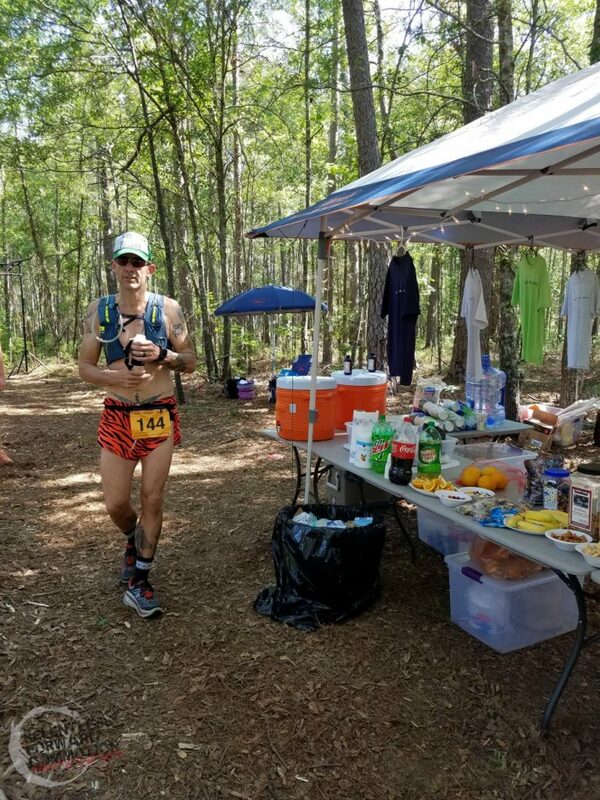 – My husband rocks, knocking out a decent 60K just weeks after his first 100 miler, in crazy heat. 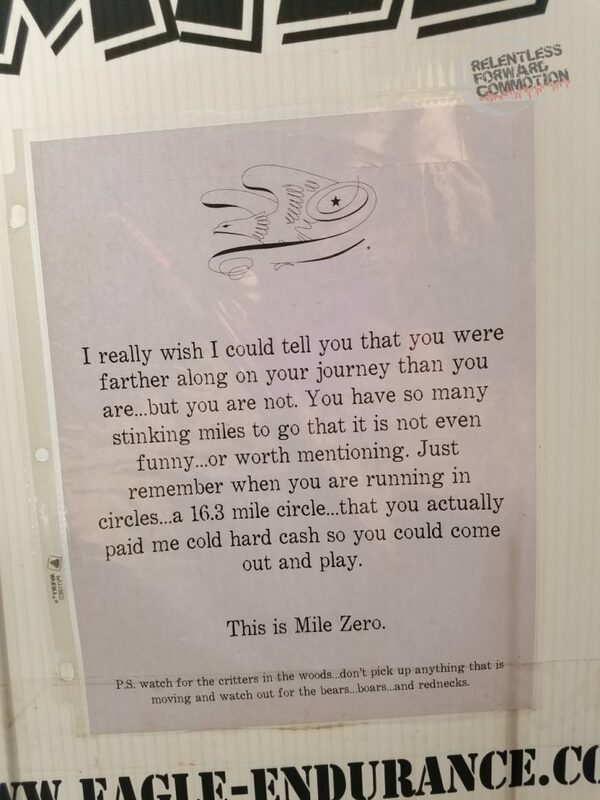 But he never, never wants to run 100 miles here. I know this for a fact, as he told me nearly 100 times. – I’m still only slightly pouting about not being able to run this race myself. – It was great to meet you and the family, finally. – I’ll probably be back next year and may run at least the 60k. (I will at least volunteer again.) 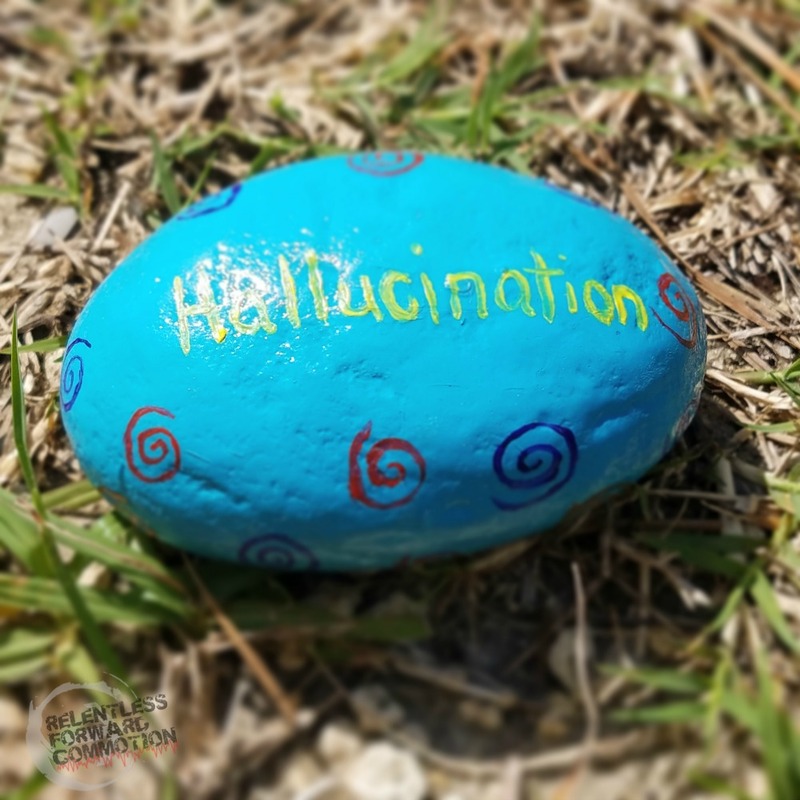 I may be at Hallucination; I’ll see how I feel after Hinson Lake 24-hour this fall. – We did have a small rattlesnake (18″-24″) visit the start/finish area a couple hours after y’all left. Fortunately, the eventual winner of the 140.6 El Diablo noticed the snake while he was resting and alerted us; we were able to shoo the snake back into the woods. 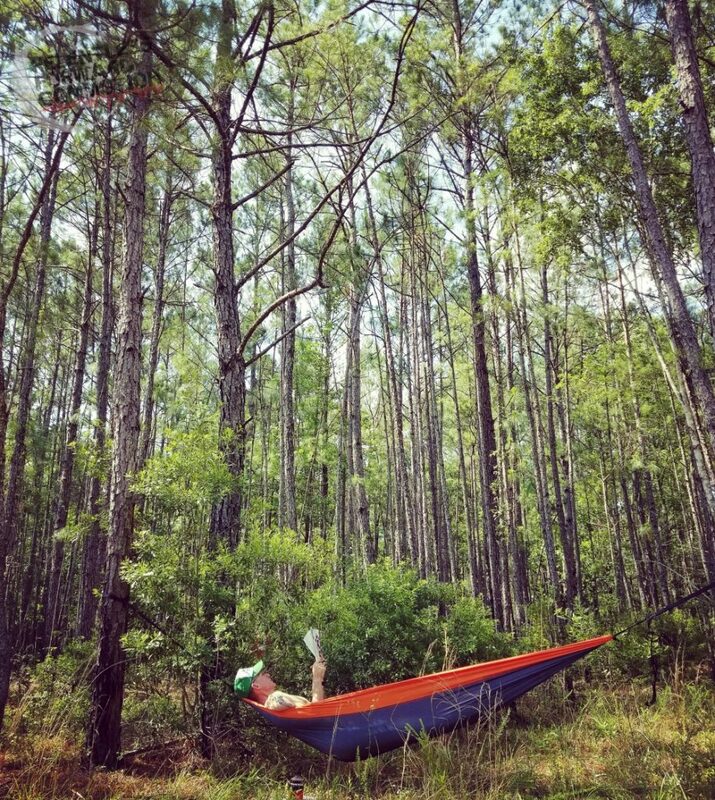 My family and I camp at Huntington Beach State Park every year, if you’re near Myrtle you should check it out. There are a few trails that are sandy, rooty, and full of snakes, you know- awesome!! Hi, Kim, I didn’t get to meet you directly but as I think you were one of Annie’s pacers, I probably saw you plenty. 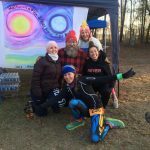 I was volunteering at the start/finish from 1pm Saturday to 7am Sunday and was the barefoot runner you may have seen during Annie’s last four miles. This was first visit to one of Chad’s races, and now that I’ve earned a couple of free entries, I’ll be back to run some of them.